Sanicula arctopoides Hook. & Arn. Perennial herb from a taproot; stems prostrate or ascending, 5-30 cm tall, branching. Basal leaves rosette forming, somewhat succulent, often yellowish, stem leaves reduced, becoming sessile, irregularly toothed or cleft, the blades 2.5-6 cm long, 2.5-9 cm wide. Inflorescence of several to many compact headlike umbels; flowers yellow; involucel conspicuous, surpassing the heads, the bractlets entire or trilobed. Egg-shaped to subglobose, 2-5 mm long, covered with stout, hooked prickles. Mesic coastal bluffs in the lowland zone; rare in SW BC, known from SE Vancouver Island; S to CA. 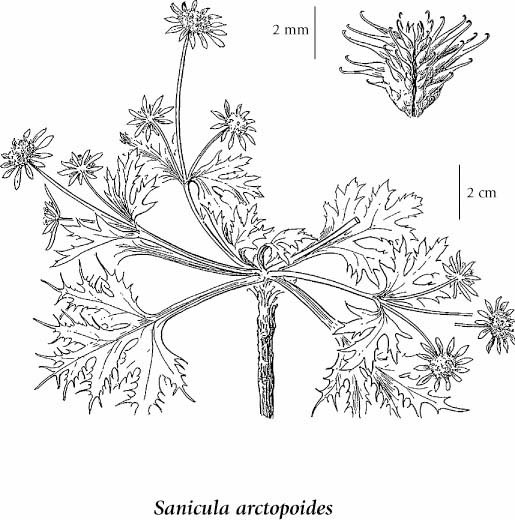 In B.C., Sanicula arctopoides is prostrate and has distinct involucels and yellow flowers, whereas Sanicula bipinnatifida has a more erect form, purple flowers, and no involucel. S. arctopoides is prostrate, has distinct involucels, and is found strictly in dry maritime meadows, whereas Sanicula crassicaulis has a more erect form, no involucel, and tends to grow in slightly deeper soil over a broader range of habitats.